In Silverlight/WPF and WPF there’s today a WebClient class for making webrequests. Under the covers it creates HttpWebRequest for sending the request and HttpWebResponse for handling the response coming back from the server. In an older blogpost, I created a custom WebClient for WP7 that added support for GZIP compression this way. This call makes all requests to www.mydomain.com go through the ClientHttp. As mentioned it’s possible to make your own requestor and completely intercept ANY requests made by WebClient! This can be a lot of work, and even if you did that, what about all the 3rd party libraries you use, where you can’t go in and change that? Well enter RegisterPrefix! Do you want GZIP support in Hammock? Done! Do you want GZIP support in RestSharp? Done! * Do you want GZIP support in [insert favorite API here]? Done! *Update: Actually this might not be the case. Some libraries uses some features that either is not possible to implement with the custom HttpWebRequest (like UserAgent), and I didn’t add support for Cookies as well. Both of these are for instance used by RestSharp. So I went ahead and updated my Nuget Package for the GZipWebClient, so go grab v1.1, and you will only have to add 1-2 LINES OF CODE, and just execute it ONCE (for instance at startup), and EVERYTHING WebClient will be enhanced with GZIP compression. You can also grab the updated source on the original blogpost here. If you want to view an image on your Windows Phone app, or on your Windows 8 tablet, most people would probably expect to be able to use their fingers to pinch zoom and drag using the touch screen. …where Thumbnail is a low resolution image that loads fast, while the full resolution Image is being downloaded. If you just want to use this control and don’t want to learn how to create a custom control, skip to the bottom to download the source for both Windows Phone and Windows 8 Runtime. Create a new folder “Themes”, add a new XAML resource file and name it “Generic.xaml”. Make sure the “build action” for this file is set to “ApplicationDefinition”. We will want to define the default template in this file for our control (if you are used to making User Controls, this is essentially where the XAML for custom controls go instead). Notice the “CacheMode” property. This is important to set, to get proper performance when zooming and panning the image. If you have a Windows Phone try the official Facebook app, open an image and you will see what I mean (if you worked on that app PLEASE fix this). Next up is the actual code. Add a new class, and name it “ImageViewer”. Make it inherit from ‘Control’. Add a constructor and use the “DefaultStyleKey” to tell Silverlight that you have a template defined in Generic.xaml that it should use. 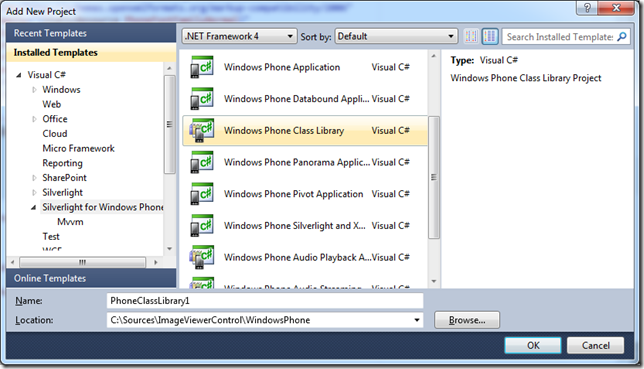 We should now be able to use this control in a Windows Phone project. 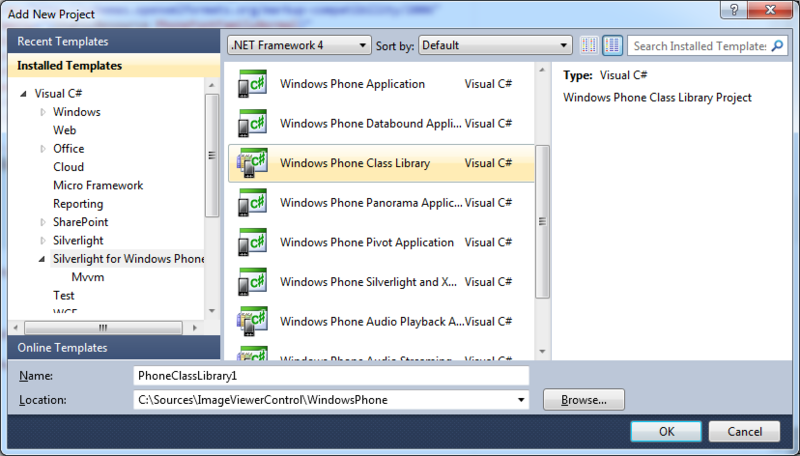 Add a new Windows Phone Appplication project to your solution, right-click the ‘references’ and select “add reference’. Pick the SharpGIS.Controls project. That’s all fine, but you still can’t use any touch to zoom the image. Go back to the code and override OnApplyTemplate(). This code executes when the template from Themes\Generic.xaml has been loaded, and it’s your chance to grab any reference to the elements in there and ‘do something’ with them. In user controls you would often set the event handlers directly in the xaml. With templates on custom controls, you will have to hook these up in code-behind during OnApplyTemplate(). Here we will hook up for the manipulation events, as well as assign a transform we will apply to the element when these events trigger. The ManipulationDelta event triggers as you move. It will give you information about how much the user dragged, and how much he/she pinches, as well as the center of the pinch. Unfortunately the pinch scale amount is shown as separate X and Y directions, and no ‘Uniform Scale’ is shown. This makes it hard to get a good average of the scale, and you would have to pick just one of them (one could be pinching and the other stretching). 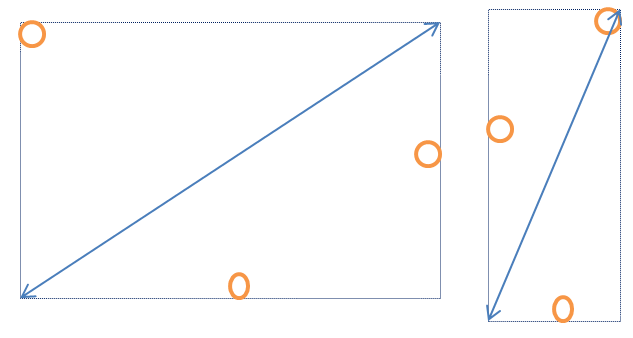 I’ve found that defining the amount you’re scaling is the change of the length of the diagonal of the boundingbox of all the touch points works well. Errrrrrr, that might have sounded confusing. Let’s use a picture instead. The orange circles below are touchpoints, and the rectangle is the box that encompasses all of them (2 or more points). 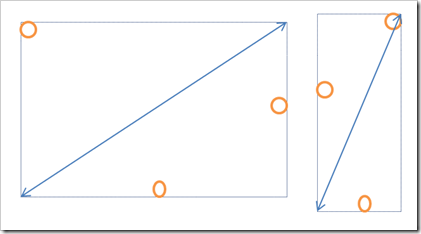 The blue line is the diagonal length of this box. So the amount of scaling = length_Before / length_After. We don’t get the actual touch points in the manipulation events. So instead I start with a simple box that I define as 1x1 and track the scaling of it. The diagonal length of that box at the beginning is the square root of 2, which we will define in the ManipulationStarted event. We also add a property for tracking the center of the box. Now what’s left is to turn off the thumbnail when the image has loaded, as well as raise loaded events for the high resolution image, so that you can display a progress bar while you wait for the image to load. I won’t go into details on this, but in OnApplyTemplate, simply grab the Image template child, and listen for the ImageLoaded event. I’ve packaged it all up in one complete control, as well as a sample showing how this would be used in an application where you would navigate to a page with this control on it. You can download the source and a sample app here. If there’s an easier way to do this, please do let me know. If not, hopefully we’ll get some more utility/helper methods as the SDK matures. UPDATE: Turns out that there is an easier way to do this after all using the Windows.Storage.PathIO class! Notice that there is also a WriteTextAsync(string,string) method. However this seems to throw an exception if the file doesn’t already exist, so I’m not sure how useful that is at this point, considering this will be a-chicken-and-the-egg scenario. So for now, the code above is still useful for writing files, and of course also for understanding the more low-level file operations.